Since time immemorial in the cinematic world of movies, the romance genre has grown and flourished, engaging audiences and viewers with sweeping narratives of all things about love and the tender matters of the heart. Whether star-crossed lovers, reconnected childhood sweethearts, or the “fated chance” meeting of two individuals, romantic movies have span the ageless tapestry of moviemaking and producing some timeless treasures and some fan-favorite gems, including The Notebook, Titanic, Gone with the Wind, Breakfast at Tiffanys, Cascablanca, and many others. Now Warner Bros and director Thea Sharrock present the current moviegoer audience with the movie Me Before You, based on the book by author Jojo Moyes. Does this feature film find love or is it’s a brokenhearted mess? Louisa Clarke (Emilia Clarke) is a gentle and perky young woman who’s having trouble securing stable employment that’s best suited for her talents, pressured to earn by her family to keep food on the table. By chance, an opportunity presents itself as Lou is offered a position as a caretaker for Will Traynor (Sam Claflin), a quadriplegic who’s perfect and privilege life with then girlfriend Alicia (Vanessa Kirby) was taken away from him after a horrible accident. Choosing to isolate himself while his parents, Camilla (Janet McTeer) and Stephen (Charles Dance), strive to support his new reality of being confined in a wheelchair, Will is immediately cold and distance to Lou, rejecting her bubbly and quirky personality. Lou, determined to win over her charge, tries to connect with Will through various activities and simple conversations, eventually (over time) discovering feelings for Will as he goes through a difficult but important decision-making process concerning his future. As a personal taste in movies, the romance genre isn’t my forte. I’m not bashing the genre and its catalogue of movies, it’s just not my “preferred” choice of movie to watch (give me an animated, action, or Marvel blockbuster over a romance movie). Still, I seeing several of the big / iconic ones like Titanic, The Notebook, Roman Holiday, Gone with the Wind, etc. I even tried my hand at reviewing one last year when I saw The Age of Adaline. So usually seeing a romantic flick isn’t on my “to do list” of seeing movies. Which brings me to me seeing Me Before You. Of course, when I first saw the trailer, I was intrigued because of all the recognizable actors and actresses in the movie. Since the movie was based off of a book, I then decided to read the book (I usually try to make a strong emphasis to do so) and took my mom to go see the movie as a late “Mother’s Day” present. As it turns out, I probably liked it a little bit more than she did. While the movie does have its faults, Me Before You is still a present feature to fall in love with. Thea Sharrock, who has previously TV episodes for The Hollow Crown and Call the Midwife, makes her feature film directorial debut with Me Before You. For the most part, Sharrock does a pretty good job with the movie, establishing Will’s life before his tragic accident in the film’s opening scene and then quickly shifts to Louisa’s life as the kind-hearted person who is seeking a job employment. Like all romance movies, the two lovers meet and fall in love with one another and Sharrock gives her two actors (Clarke and Claflin) a lot of time to do so, sharing the juxtaposition of their lifestyles and personas (Louisa is eccentric, perky, and from a working class family, while Will is melancholy, sarcastic, and from a wealth privileged family). I do have to commend Jill Taylor, the film’s costume designer, for her work on this feature. The outfits that she made for Clarke’s Louisa is truly outstanding with different variations of it (big kudos). Another person I have to mention is the film’s cinematographer Remi Adefarasin who presented the feature with sweeping cameras angles and position. In all honesty, Me Before You is beautifully crafted as a theatrical film. As said above, Me Before You is adapted from the book of the same name by author Jojo Moyes. Moyes, who has written 13 novels so far, also lends a hand with the film, penning the script for the movie. However, its kind of a mixed bag of sorts. Yes, the script hits a lot of the familiar scenes from the movie (both joyfully and sad), but the movie fumbles in some of its storytelling. Most notable is in the character of Will. While he is understandably negative (a little bit of a “Debbie Downer”) and sarcastic temperament towards Louisa’s overall perkiness, his attitude, after a while, seems to be on the up and up with her new caretaker companion. Meaning, there’s no conflict between him and Lou as they both fall in love with each other as both characters seem to fall in love with each other right off the bat (beyond a couple of scenes of the two not getting along). Also, like a lot of “page to screen” movies, the film seems to omit several scenes from the book that probably could’ve been beneficial towards this theatrical adaptation. One particular is Lou’s investigation into understanding quadriplegic, which the movie had the platform to speak about this, but elects not to. In short, while the movie isn’t syrupy and sappy like a Nicholas Spark’s film adaptation, Me Before You could’ve been better in the script department, which is strange as the author of the book wrote the movie’s screenplay. Like a lot of romance movies, the two central characters (the two who fall in love) are usually the main focal point in the film’s narrative. Luckily, Sharrock and her crew selected two fine individuals to play Louise Clarke and Will Traynor. Emilia Clarke, most recognizable from HBO’s Game of Thrones, is incredible as Louisa Clarke. She’s perky and bubbly and completely nails the character, capturing an extremely endearing persona that you actually care for (I certainly did). It’s a great role for Clarke to perform (a role that’s suited better for her than her one in Terminator: Genisys) and something completely different from her commanding role as Daenerys Targaryen from Game of Thrones. Opposite Clarke is Sam Claflin as Will Traynor. Claflin, most notable from Starz’s television min-series Pillars of the Earth and The Hunger Games movies, does good work, but (to me) I think Clarke does a better job (again another problem with the script). Claflin as natural charm and, when the script allows him to be, expresses it vividly through his persona of Will, a man tortured by what happened to him. Still, it helps that both Clarke and Claflin play off of one another, making their chemistry with each other believable, using their talents to make Me Before You breezy and buy into their romantic relationship. In supporting roles, Me Before You has talented group that play the story’s minor characters. Naturally, with a movie focused on its two central characters falling love, the minor characters are, more or less, pushed to the wayside and are simply there to strengthen two protagonists or help drive the narrative forward. Thus, these characters are mostly “underserved in the movie’s grand scheme”, but still are good because of the actors and actresses that play them. This includes Harry Potter alum Mathew Lewis as Louisa’s fit fanatic boyfriend Patrick, Samantha Spiro and Downton Abbey alum Brendan Coyle as Louisa’s working class parents (Josie and Bernard Clark), Doctor Who star Jenna Coleman as Louisa’s sister Katrina Clark, Janet McTeer and Charles Dance (another Game of Thrones star or rather alum) offer a sympathetic dynamic as Will’s parents (Camilla and Stephen Traynor), and Stephen Peacocke as Will’s male nurse assistant Nathan. As I said, all are good actors and actresses, but their characters are merely devices (whether story or characters devices) to move things along, which is shame because I do like all of them. Love, loss, and living boldly is the mantra found in the movie Me Before You. Director Thea Sharrock feature is a movie that really tugs on the heartstrings and presents itself to a true “tear-jerker” for viewers everywhere. 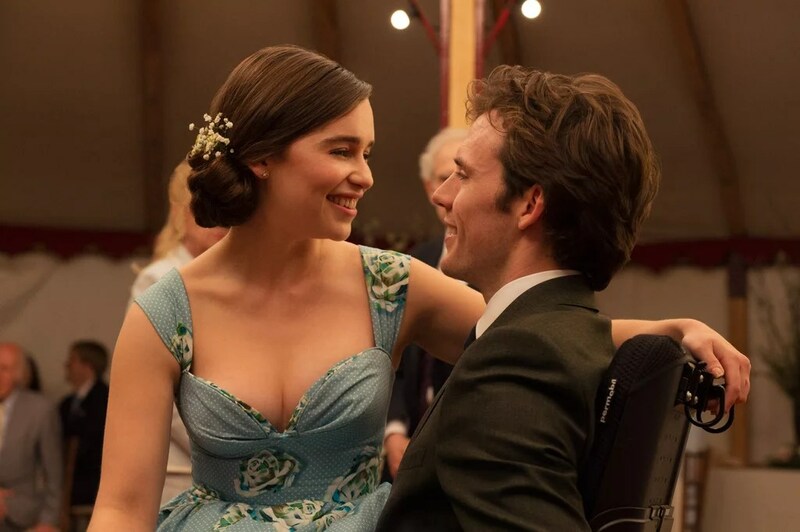 While the movie isn’t completely outstanding, with some noticeable problems in storytelling direction (formulaic) and several others, Me Before You is still enjoyable, with enough love and care put into it making the movie as well as a talented cast (especially in Emilia Clarke). Personally, I liked it. Yes, it was formulaic and there could’ve been several changes that could’ve made the movie better, but, in general, the movie was good (and that’s speaking from someone who really doesn’t like romance “tear-jerker” movies). Thus, I would recommend this movie. While it isn’t a sweeping epic like Titanic or memorable like The Notebook, but Me Before You succeeds in letting your heart swoon and swell with pleasant endearment as you (the viewer) follow the relationship between Louisa Clarke and Will Traynor. Hey, there. Thanks for the wonderful comment. I’m truly honored. I too the read the book and I did enjoy the movie. Clarke was excellent in the film and the movie is well-made. Much better than a standard Nicholas Spark adaptation.